We have two really cool art events happening tonight in Charleston. Clement Photography will set up at Bluegrass Kitchen to take tintype photos, and The Art Store will have their last opening in South Hills before they make the move downtown to Hale Street. 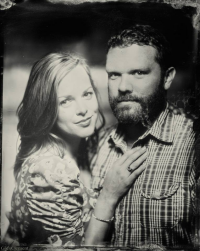 On the road from their base in Portland, Oregon, Clement Photography is in town and tonight they bring their tintype studio to Bluegrass Kitchen in Charleston! They will be making one of a kind portraits from 5-11pm. 4×5 tintypes are 40$ which includes a digital scan and the original metal plate that will last for generations. This is a very cool thing to have, and the price is very low for a tintype photo. After you get your portrait made, stick around and have dinner. It’s BGK. You know it’s good. 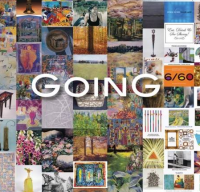 The Art Store is celebrating its last opening event at their South Hills gallery with a selection of works by their represented artists, titled “Going,” opening Saturday, April 26th from 5:30PM to 7:30PM. The event will celebrate TheArt Store’s time on Bridge Road with a trip down memory lane. This will include visuals from throughout their history in South Hills as well as highlight some elements of the future gallery space on Hale Street in downtown Charleston. The show focuses on art pieces from the classic Art Store artists, many of whom have been with The Art Store for more than 30 years. The featured artists include Ellie Schaul, Helen Chilton, Stephen Smigocki, Maggie Starcher, Caryl Toth, Harold Edwards, George Snyder, Jennifer Snyder, Katherine Cox, Jan Griffin, Allen Jonas, Caroline Jennings, Nancy Berlin, Susan Poffenbarger, Katherine Kadish, Barbara Marsh Wilson, Diane White, Grace Martin Taylor, Henry Isaacs, Jason Berger, June Kilgore, Helma Groot, Jim Gibson, Susan Petryszak, David Stern, Ed Kellogg, Selina Trieff, Steven Barbash, David Riffle, Sue Wood, Chris Dutch & Robin Hammer. The exhibition will continue until the gallery moves in May. The Art Store will hold their first opening at their new location, which will also be their first Art Walk, on June 26th and they will participate in this years’ FestiVALL on June 28th and 29th, all at 233 Hale Street.